In the steampunk realm, vehicles are powered by the Victorian power of choice: industrial steam. Well, with a futuristic spin, of course. 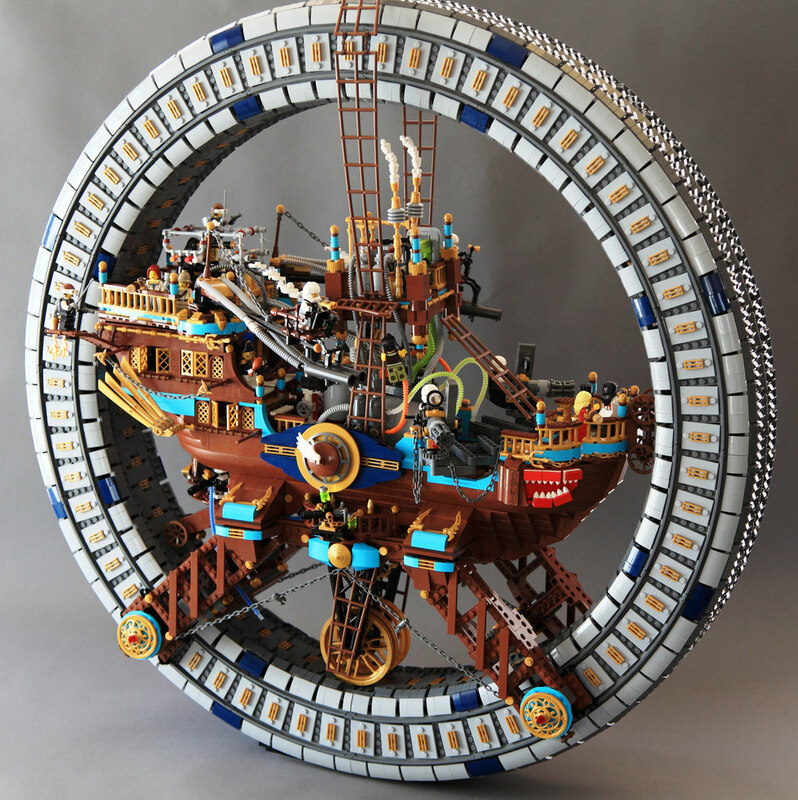 This LEGO steampunk galleon by Chris Wright fits the genre perfectly — a huge steam-powered mega-wheel with a central ship that seems to defy gravity. 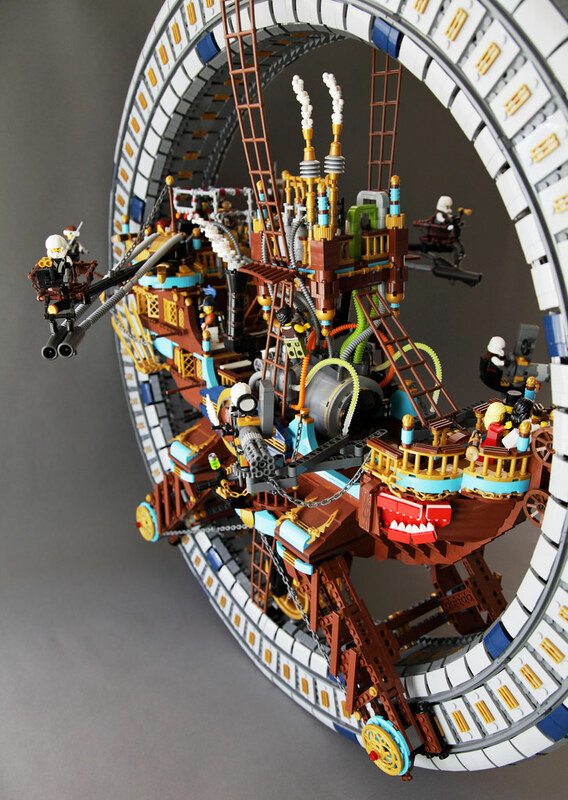 The detailed central minifigure-scale ship remains stationary within the huge outer wheel thanks to a collection of wheels at the points where the two meet. The ship itself is full of great details but the first thing to catch my attention is the size of this thing and colour scheme thanks to those Medium Azure highlights throughout. 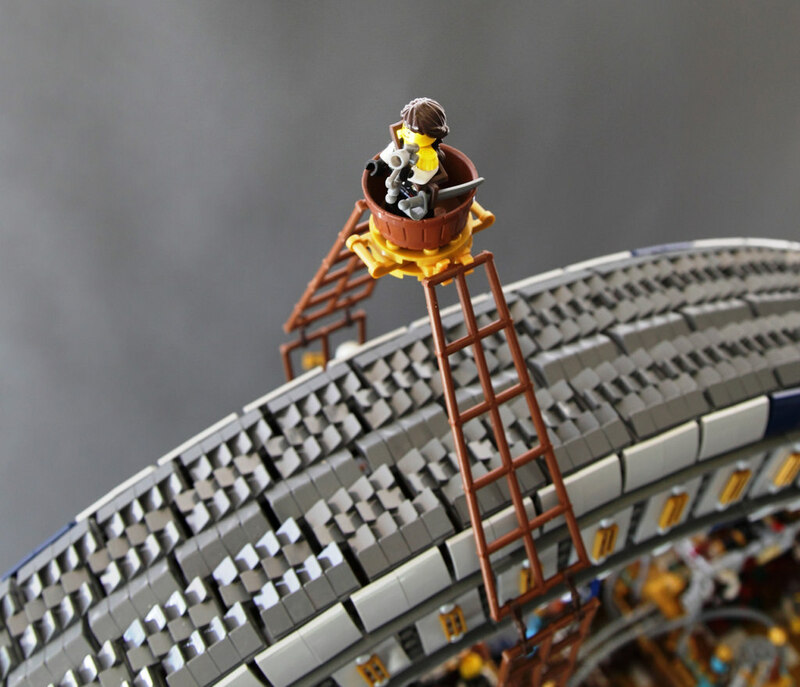 Using 7500 bricks and standing at nearly a meter high (including the crows nest), the outer wheel is also 10 studs wide. This girth gives enough stability to allow the wheel to not only be free-standing, but roll! Thankfully Chris has a video of his wheely awesome Steampunk ship in action, without this we would be saying – prove it or it didn’t happen. It’s easy to be mesmerised by the huge rolling wheel, but take a closer look as Chris has built some great little details into the ship itself. Such a highly prized vessel needs some protection so those out-riding gunners have Gatling guns and what appears to be some extreme water pistols. There’s a brave lady up in the crow’s nest looking out for any children that happen to be in the way of the path of the ship as it rolls across the convention hall floor. This shot of the crow’s next also allows a moment to admire the effort Chris went to by creating a tread on the wheel’s tire …all the better to make those sharp turns. There’s a lot more to admire in this build than I can cover in one blog post so please go and enjoy some of the close-ups in Chris’ Steampunk mega wheel album.